A mostly uneventful afternoon exploded into a fury of madness in the final two minutes of Sunday’s matchup between the Vikings and Ravens. Trailing 12-7, the defending champs needed to pilot a go-ahead drive. Ravens offensive coordinator Jim Caldwell decided to go with the no-huddle, despite the snowy elements. It was more than effective. Quarterback Joe Flacco authored a nine-play, 63-yard drive capped by a touchdown pass to tight end Dennis Pitta, who was just activated to the 53-man roster. Pitta, who showed no signs of playing on a surgically-repaired right hip, finished with six receptions for 48 yards and a score. Ravens 15-12. The Ravens had the lead, the home crowd on their side and only 2:05 remaining on the clock. Well, the Vikings, who were without Adrian Peterson in the second half, weren’t backing down. Running back Toby Gerhart would rip off a 41-yard touchdown scamper, taking the air out of M&T Bank Stadium. On the ensuing kickoff, kick returner Jacoby Jones slashed and dashed his way 77 yards for a touchdown. Seventy-six second left on the clock, Matt Cassel and Co. had hopes of tying the game with a field goal. Cassel’s first two passes fell incomplete, but on his third attempt he completed a short pass to rookie Cordarrelle Patterson. The Vikings rookie showed off his electrifying speed and took it 79 yards for a touchdown. Again, the Ravens sideline was devastated. Players looked up to the jumbotron with angst and looks that could only mean "Why?" on their faces. But did the Vikings leave too much time for Flacco? Of course. 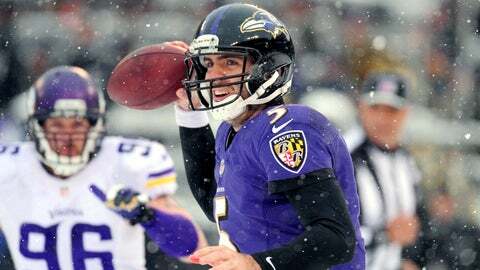 Flacco and the Ravens offense rolled out to the 20-yard line with 45 seconds left in the game. Fortunately, they were judicious with their timeouts during the second half and had two remaining. It only took six plays, but Flacco ended up connecting with Marlon Brown for a nine-yard toe-tapping touchdown. The replay assistant confirmed it was a touchdown.